I have been asked to copy a weird plank door by a contractor who can't wait the 8 week lead time from the factory (for a very expensive door that he probably underbid and stalled on while he schemed to minimize his losses). The door is standard entry dims., 1-3/4" x 36" x 80". The weird part is that it has a 6" top rail and a 12" bot. rail that run the full width of the door. There are an odd number of planks allowing for the center "plank" to be recessed, clear, 1/2" glass that runs from top to bot. rail. It will be painted both sides. I will probably use 8/4 sapele. Location is N.W. CT., very humid summers, fairly low humidity in winter. Always comfortable inside. 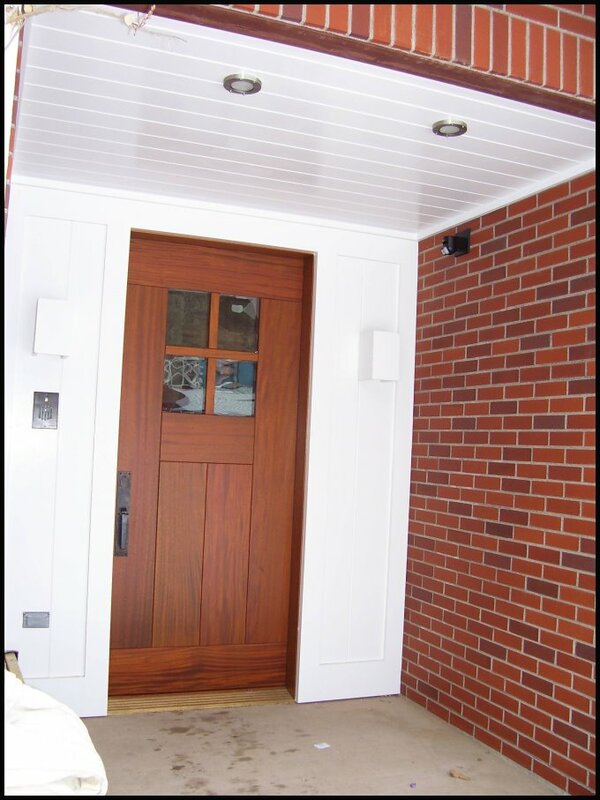 The door will never see direct sunlight or rain being on a very large, raised, covered porch. I have been given a fair amount of leeway to alter the design. I may even be able to run the stiles full length as well. Maybe that may help the joinery. Other threads suggest a floating tenon glued to each stile, and allowing the planks to float freely about the frame but this door has a piece of glass in the way. I am concerned that without the intermediate tenons (hidden rails) the door will be weak, but am not sure. If so, I'd like to design the structure a little bit differently to overcome this weakness, maybe by joining the planks nearest the glass to the rails with a tenon. There will be ~15" wood to either side of the glass - 1 stile and 2 planks. Sorry, I can not figure out how to post a link in-line or edit my post. The link got wrapped so it was not easily pasted. Here is a drawing of the door, and here I will try to post the link again. Edge glue verticals. Cut slot in top and bottom plus rails for a spline stopping before the outside edges. I would not use a mortise tenon for this application. You will want to make spline stock at least .75 x8''long x width of each outside style. Make sure to cut small grooves to allow for better glue surface adhesion. The splines will receive 4'' into style and rail. Don't mortise all the way to the outside edge of the rails and styles. Similar to a haunched mortise and tenon. This will hold glue in and hide the joint. Next make splines for the inside styles or panels. They can be smaller. Only need to go 2'' into both pcs. Glue splines into top and bottom of inner styles. Next glue outer splines into both top and bottom of styles leaving roughly .5'' of space between the 2 tenons. Make sure to clean all glue out of joint. The next day I would do final assembly. Only glue the 4 outside splines Let the 4 wider inside splines float in the joint to allow for expansion and contraction. You may also want to put a micro bevel on both floating panels tops and bottoms where the joints are to hide expansion and contraction. Sapele will work well and I would also use epoxy like west system for the glue joints. Here's a drawing of what I think you meant. Is this right? The dark rectangles are the splines. Would the splines be sapele also? For sure on the West. Sapele will work well for the splines. We have used marine grade ply for large splines in the past hoping it would negate any opposing swelling between the two joints and floating members. I really can't say if it makes a difference though as I have never put a solid spline joint side by side with ply spline joint for any period of time. Neither joint has ever failed. 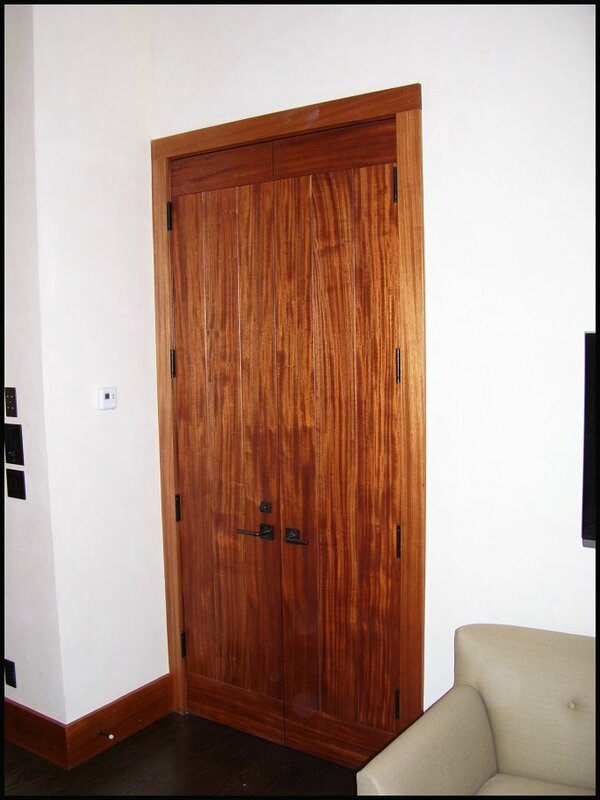 Most of our custom doors are mahogany species glued with west and are all solid styles and rails. They are almost all directly on or near the ocean from the cape to N.H.
We even have doors on Buzzards Bay that actually get submerged in high water and storm surf that have not failed in 17 years. 8 doors in total. I am really concerned that there is not enough holding this door together by only gluing at the 4 corners. This door will be very protected by cover and paint. Are we designing in too much allowance for wood movement at the expense of too little strength? This door will be heavy. Won't it sag and pull itself apart with such a small glue surface where the bottom rail is essentially hanging off of the stile? Had the bottom rail been tenoned into the stiles like usual with wide tenons and shoulders I think I would be much less apprehensive, but its not. Can you please explain what would be wrong with gluing the 2 planks adjacent to the glass to the rails and not edge gluing the planks in order to allow for wood movement? In that case I would still allow the center plank on either side to float. In fact, I am so ignorant in this type of construction, that thinking about it, I do not understand what would be wrong with gluing the center plank into the rails also (but not edge gluing it to allow for expansion). To me that would allow for more strength as well as keep the plank centered. I am definitely in need of an education here. Everyone one of those boards is going to expand in width, not length. Glue all of them solid to the top and bottom rail, and the wood can't move. Those rails will attempt to hold it solid. Unless you have some kind of wide tongue and groove that will show gaps in the winter and be tight in the summer. If you don't give enough room for it to expand around the glass, and it might blow it up. Quartersawn wood moves a lot less. Slab doors went out of favor in colonial times since they stick in the summer and you can see light in the winter. Veneer is the way to go. Make it look like a slab, don't make a slab. Gluing the doors in the 4 corners is more then adequate. With splines of this size and epoxy properly applied in the joints the door should not fail. You could glue the entire length of spline into the top and bottom rails however it would add considerable strain to the joint with seasonal expansion and contraction mainly of the top and bottom rails. Using quarter sawn stock as Rich pointed out will help and almost always does with doors. Ribbon grain Sapele is in my opinion the proper selection. Leave adequate room for the glass and glaze with silicone after finishing. We have made numerous doors 9' and taller with only top and bottom glue joints and no center rails. Joinery is the key. You could go with a slab door but as Rich said they have seasonal issues. I would steer clear of veneers. Your adding unnecessary labor to a rather simple design and build. It may seem like a difficult door to produce but if it was Simpson would not be making it. Got it. I'm kinda embarrassed that I actually said I could glue all of the planks to the rails without detriment. What was I thinking? Sapele is available at my local mill. He said I should have no problem picking through it for the quarter sawn. I was planning on that. The splines will definitely help with getting the shoulders perfect quickly. And the West System is readily available here on the Hudson. I appreciate the reassurance on the joinery, Brian and I do feel better about it after your response but I'm still a little leery. Since the contractor has given me some latitude to modify the design, do you think it would be significantly stronger to build the door with full length stiles so that the rails run into the stiles instead? Or are there other problems I am not foreseeing using that method? In using a solid sapele spline does grain direction matter considering the size of the splines?? Several years ago I had a redo job of ipe "rings" that came apart due to the splines easily breaking along the grain lines. I think those splines were 3/8" thick x 5" wide. I fixed the job by simply turning the grain of my splines and re-glueing. Made the rings plenty strong enough to handle for installation. You could run the styles into the depth of the mortise. The main reason for not doing this in this application is simply to glue each style up in one pc and apply splines after. If you want to add the labor to run tenons on the styles then glue sand then glue all other pcs after then that will also work..
Shauns question about the splines is a good one.. You should always run the splines grain in the direction the most resistance will occur. Which in this case would be vertically.. In the case of a standard door would be horizontally and in the case of a Barrel door would be horizontally. I forgot to mention I would never use Ipe for anything like this. Its not an architectural building material but it does look great on decks. We did a house full of this type door a few years ago. We used square edge cope and stick, Splines, not glued between the planks, loose tenons glued on the interior planks and dowel joinery glued at the corners. Any type of joinery done right should work. Material should be well seasoned or engineered. This allowed the planks to expand or shrink a little. In my area wood usual shrinks but the opposite might be true in CT. I was worried about this job holding up especially the exterior door with the wide members. Last time I looked everything was fine. 6 or 7 years old now. I agree that using ipe when glue is required for joining is not a good idea. I fixed a job on a yacht that had ipe decks, handrails and accent pieces (large trim rings that decorated ceiling fan recesses) The previous builder used gorilla glue and glued the rings together with splines and edge glued the handrails together. All met with failure! I cut strips and face glued all the ipe up and around all the curves with TB3 and except for one handrail in back that they tried to tie the boat up with they all remain intact 4 years later. I think you must consider all the aspects whether positive or negative to get best possible outcomes. I have built many doors like this, but my methods are somewhat different, and based on historical doors that have survived decades. I would build this as a three ply 'ladder core' door, with the center ply being a mortise and tenoned frame the full width and height of the door. Two stiles 5" wide or so, and about 6-8 rails with 3" tenons into the those stiles a very rigid core. All from jointed stock at 3/4" thick. This is simplified - yours will be more complex with the glass in it. Think of the two faces as laminations. I would join the two vertical stiles to the rails with long, open tenons the full width of the rails, again, all at 3/4" thick. The filler boards would each be tongue and grooved into each other and the stiles and rails, glued to the core, with a gap between the t&g boards. The gap will be about .050 if v-jointed, and about.075 if square edged. Do not glue the T+G except at the ends of the boards. The idea is to let each board move in it place, while the outer perimeter is rigid. Ct is like Indiana - if anything, these boards will swell if the lumber is at 6-8% now. Fill the voids in the ladder core with rigid foam insulation before adding the second face. Use quarter sawn stock - especially on that wide bottom rail. I would even consider making the bottom rail a five ply rail - face at 1/16", cross band at 1/16", core at 1/2" of quartered solids, then cross band and inner face. I see quartered Honduras Mahogany at 12" that hasn't moved, but I still would loose sleep over it. Other species I would not trust. As stated to an earlier query about planks in a door, things are not always what they appear to be. Joe Calhoun builds a good door, and don't overlook his comment on "engineered" stock. Stable stock will eliminate all the movement issues and allow total freedom for reveals, joints, etc. Thanks for detailing your method for building this door, David. I need to acknowledge that you, Joe and Rich all would not build this door solid. Having never built an exterior door, this is a daunting task for me, not only for the methods and materials, but for the size of the joinery and the parts. Your suggestion to through mortise the outer boards might be beyond my capabilities. First, does the core mimic the outside in that the core rails run the full width of the door? You said 5" stiles for the core. What should the widths of the other members of the core be in this case, especially the bottom rail? It sounds like you mean to apply 3/4" T&G on the face. Would 1/2" work or is that too flimsy and subject to warp, as I assume? Are you proposing to build a 2-1/4" thick door? I was going for 1-3/4". I understand you to be saying to glue the perimeter rails and stiles to the core, and let the other boards float. Could you clarify what you mean when you say not to glue the T&G except at the ends of the boards? If the core rails are not the full width of the outer rails, will there be an issue with cross-grain movement where the outer rails are glued to both the core rails and stiles at the corners? Or should the core rails be the same width as the outer rails for this reason? Would your suggestion to build 5-ply bottom outer rails allow for a narrower bottom core rail? I neglected to mention that this would be a 2-1/4" thick door. Pretty much the standard thickness exterior door around here until after WW2. You can make thinner faces - 1/2" - but the 3/4" allows for a t&g joint along their length. You should have something to plug the gap, since a gap has top be built into the door. 1/2" can allow for shiplap, but then one edge can curl - the t&g holds everything parallel. Think of those floating face boards as 'semi' floating - they are glued to the core rails, and to the horizontal face rails where they meet, but not to each other along their length. Let each one move in its own little place is the guiding principle. Cross grain movement will be most threatening in that bottom rail. I'd do several things: redesign it to 10" max, with quartered materials. The 5 ply is foolproof, though, and makes for a better long-term solution, in my opinion. The pictures show a plank door with a small window going together: core, faces, and second face, with spacers. My other recommendation is to sub this out to a pro shop so you can do what you are good at, and lessen your exposure. It sounds as if you are capable, but there are lots of things about doors that are not anticipated until after they are made. Also to be considered are the jamb, sill, weather strip, finish and hardware. Am I understanding you correctly that each outer board is glued to every inner core surface it contacts? In other words would the entire face of the core be covered in glue? I have to ask because I am not used to gluing anything but veneer cross-grain so I am not sure if you are telling me to do this. Also, what glue do you recommend? And yes you are right, I should not be building this door. Of course, "I'll look into it" has turned into, "where's my door?". But this contractor knows I am inexperienced building exterior doors and I have kept him informed of the options and risks. He wants it yesterday and so he is taking all of the risk. I will do my best but I also will not build it if I don't think it will be satisfactory. At this moment, I want to build the ladder core door, even though Brian, who lives closest to my climate has assured me that it can be done solid. I just feel that the 3 ply door is less risky as far as stability and strength. At this time, I have the lead carpenter checking out the existing hardware to see if it will fit the 2-1/4" door. Its expensive and the contractor said if it doesn't fit its back to 1-3/4". Maybe I could get the hardware to stretch to 2"? Do you think 5/8" T&G would work? I'm guessing that you are recommending 3/4" T&G because any thinner might leave too thin of a wall around the groove and possibly snap off under stress? "I need to acknowledge that you, Joe and Rich all would not build this door solid. Jeff, we did do this job solid. The exterior door totally solid because we had some exceptionally good wood. Not always the case. The interior doors were only 1 3/4" thick and we used a stave core stile on the long edges. We do plenty of ladder frame plank doors pretty much as Dave describes only using LVL for the ladder frame. What he describes would also work here. His method will be more costly and ladder frame doors lend themselves to 2 1/4 or thicker doors. But you have a stile and rail door here with just a little different arrangement of the stiles and rails. The location of the window actually makes this pretty easy to construct solid with stave cores. As I said in our area wood shrinks. You will need to calculate worst case expansion and contraction for your area. Even if doing the ladder frame. "But this contractor knows I am inexperienced building exterior doors and I have kept him informed of the options and risks." Don't kid yourself Jeff. If it goes bad, you will be number one on the hit list. The more I look at this, the more I can see it go as solid wood, per Joe C's suggestions. I think this is an example of how two different methods can meet each other and both be equally sufficient. Perimeter parts tenoned and rigid, with floating panels/boards within. The only part that I would obsess on is that lower rail - that would definitely be made as a 5 ply rail. Something has to be done to keep it from cupping. The two boards that flank the glass should tenon into the horizontals, and the other two boards should float as panels. The best advice I ever got was from a mentor of sorts that would assign me work many years ago in my first real wood job. I asked how to build the project, and he would say that I would figure it out. And I would. But after a while, when I was done, he'd mention 2 or 3 other ways of doing this or that. When I asked him why he didn't give me those suggestions before the project, he said that the best thing I could do was to come up with 3 good solutions on my own and then select the one I want. This has kept me from rushing along with the first thing that came to mind, only to find myself painted into a corner of some sort. I guess I was using the term "solid" to refer only to "solid wood", not engineered. I suppose I am constructing this door solid after all, in what I now would describe as as "solid stave core construction". Hope my terminology is right. It is going to have 4 pine stave core members with mahogany veneer and edges for a 1-3/4" thick door: 1\ 5-1/2" Top Rail, 1\ 10-1/2" Bottom Rail, 2 side stiles at 14-1/2" wide each. The ends of the rails will be edged. The plan is to spline or tenon and glue the stiles to the rails along the entire width of the stiles using west system and leaving a gap in the center for the glass which will be stopped on both sides, the outside stops being glued. After the glue up, I will route the v-grooves into the door. It was proposed by the stave core manufacturer to build a stave core slab, veneer the entire thing and then v-groove. I don't have the means to build that way and he wanted too much to rush it and need to get this thing done. Also, I wasn't so sure about that idea. So I made the quick decision to have him rush the parts as I think I know how to do this, with the stave core modification to Brian's proposal. I thought this mod would allow me to add the extra strength to the joints I want by allowing me to glue the entire length of the joint instead of floating most of it. I also thought it to be a much more stable material and significantly decrease the likelihood of warping. Lastly, I like that there will be no expansion and contraction between the v-grooves. The v-grooves will be narrow, the specs call for 1/8" which I will probably increase slightly because of the paint. My main reason for choosing to build and v-groove in this manner was time, knowing that it will be painted and is under very good cover. I did consider the ladder core in depth. But the time I thought it would take to build as well as not being comfortable with my understanding of the method stopped me in my tracks. Thanks for everyone's input. You guys helped me a lot. I appreciate all of your generous time and wisdom. Be careful with all this advice. My method requires a small gap in addition to the v joint between each board. This is to allow the member to expand a little. As it shrinks the gap will get bigger. Based on experience in my climate this works. As I said most everything shrinks here more than grows. Stave core with solid pine for the core will still expand and contract. The idea of stave core construction is to keep the members from bowing, cupping or twisting. If you don't want any gaps then you would need to do the entire door with some type of substrate that does not move, veneer to the design and route in the Vs. I have seen this done with light weight honeycomb cores with 1/2" or so MDF faces inlayed with solid material where the Vs are routed. I do not like building exterior doors with thin veneer but is the only solution if you cannot live with the gaps. Jeff, Have a look at this UK door.